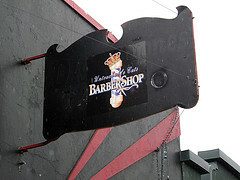 A couple of weeks ago I read in the local paper that a chili parlor was opening up in Tacoma. My husband really, really likes chili so we tried it the other night. The Chili Parlor, 5640 South Tacoma Way, is modeled after Cincinnati chili parlors, which apparently are ubiquitous in that part of the country. I had the chili fries with beer battered french fries topped with their trade mark chili and cheese. Dear husband tried the spaghetti which was also topped with chili and cheese and was served with oyster crackers. We both really enjoyed our meals and the portions were plenty large enough so that I had leftovers. 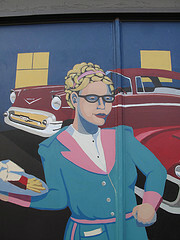 The 50s diner decor is charming and the folks there working provided excellent, cheerful service. My husband is already making plans to take a friend there. 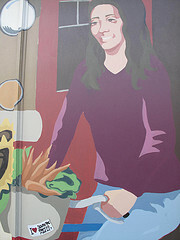 The motto at The Chili Parlor is “it’s a great day for a three way” referring to the primary three items in a dish (spaghetti, chili and cheese). A four way also has onions. Maybe next time! This entry was posted in Coffee Shops, cafes and bistros, Restaurants, Tacoma, WA State - Pierce County and tagged chili, chili parlor, Cincinnati, french fries, friendly, great day for a three way, new, oyster crackers, parlor, service, South Tacoma, South Tacoma Way, spaghetti on March 6, 2016 by admin. 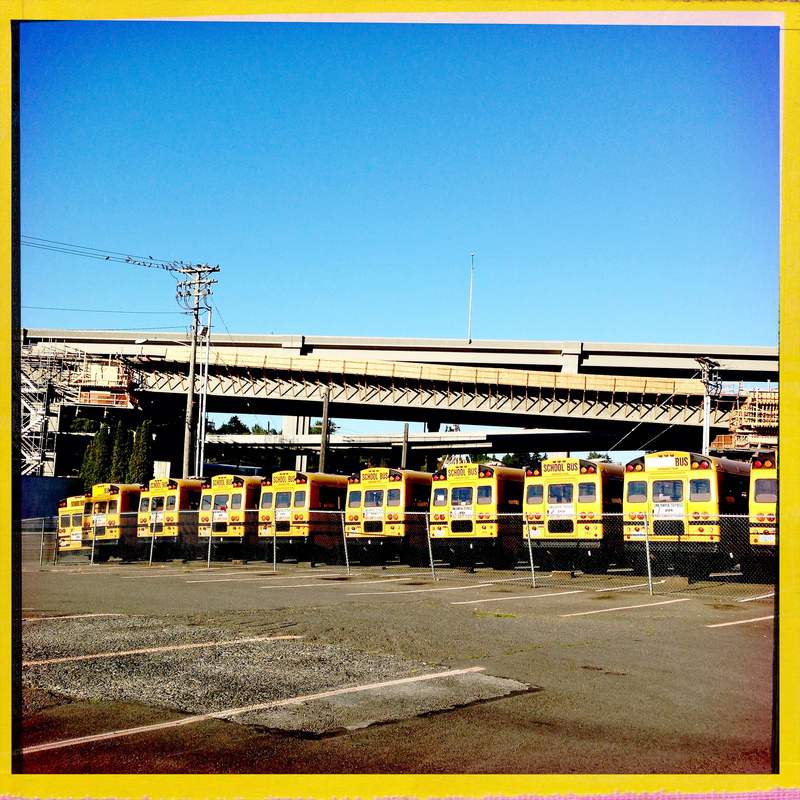 There are all the school buses just waiting for the first day of school 🙂 This photo was in the Nalley Valley part of town at the southwest corner of South Tacoma Way and Sprague Avenue. I could only safely capture some of the buses, but the image below (thank you Google Earth!) shows that there are many more buses. I think there is a special star in heaven for school bus drivers! 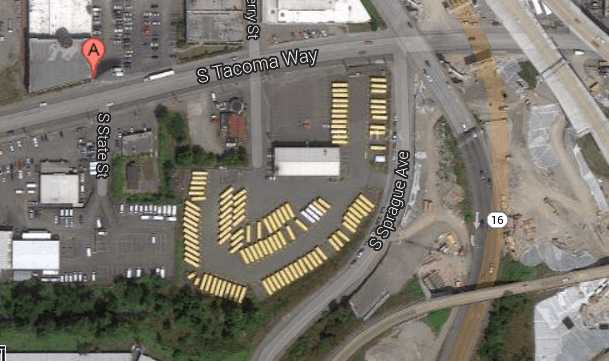 This entry was posted in Industry, Schools, Tacoma, WA State - Pierce County and tagged bus, buses, drivers, lot, Nalley Valley, parking, school, South Tacoma Way, Sprague, Tacoma on August 20, 2013 by admin. 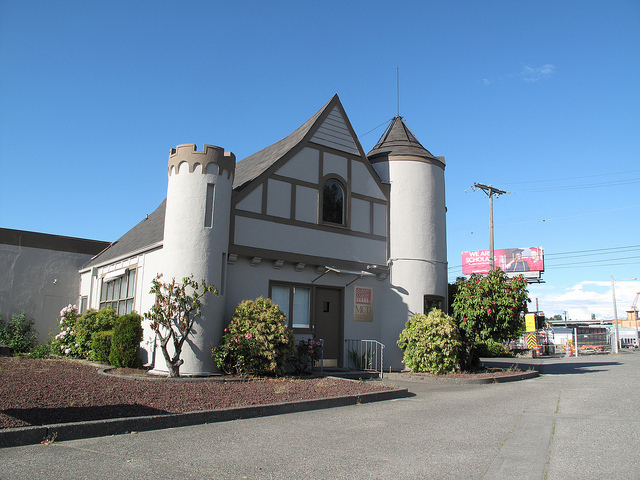 The castle like commercial building at 2515 South Tacoma Way was built as the Tillicum Toy Company in 1930 and sold Tacoma made toys all over the United States. 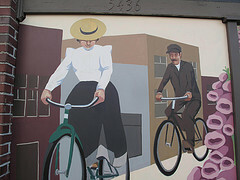 It the early 1930s it was the largest toy plant on the Pacific Coast. 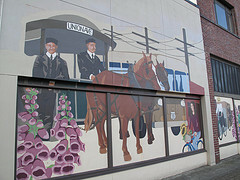 It has also been owned and/or occupied by the Tacoma Milk Shippers Association, a cheese factory, Farm Maid Ice Cream and Darigold Farms. More recently it was MDC Technologies. 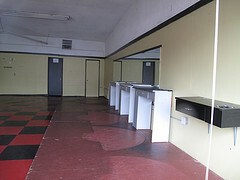 The building is currently available for sale. 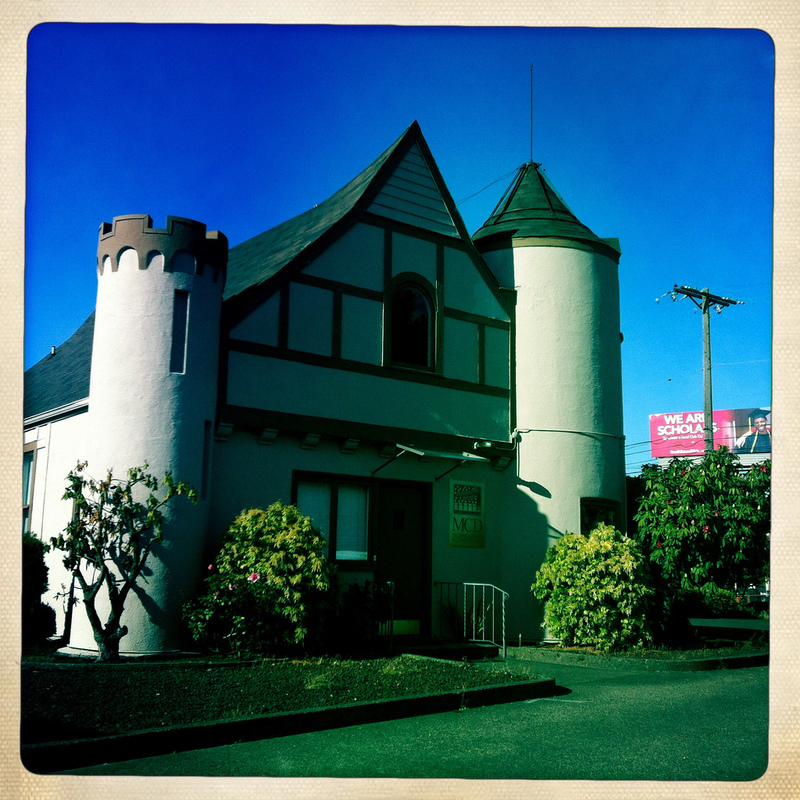 While looking for more of the building’s history, I found this website devoted to buildings made to look like castles. This entry was posted in Industry, Tacoma, Their future is in question, WA State - Pierce County and tagged a cheese factory, Building, Castle, commercial, Darigold Farms, Farm Maid Ice Cream, MDC Technologies, South Tacoma Way, Tacoma, Tacoma Milk Shippers Association, TIllicum Toy Company, Turret on May 16, 2013 by admin. 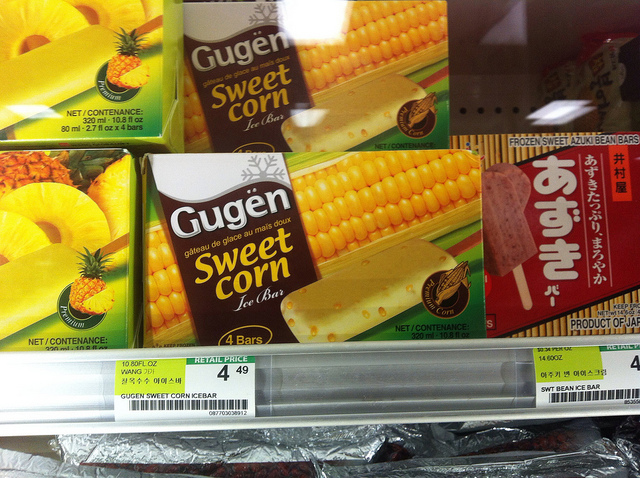 Actually there were two types of sweet corn ice cream bars at the H Mart, which recently opened at 8720 South Tacoma Way in Lakewood. 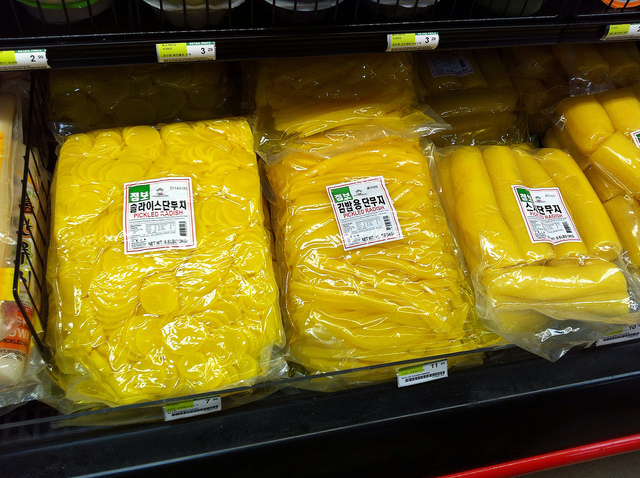 Dear daughter and I visited and found many delightful food items including udon (which she loves), mochi, fresh turmeric, those long vegetable things (I knew I should have written down what they were! 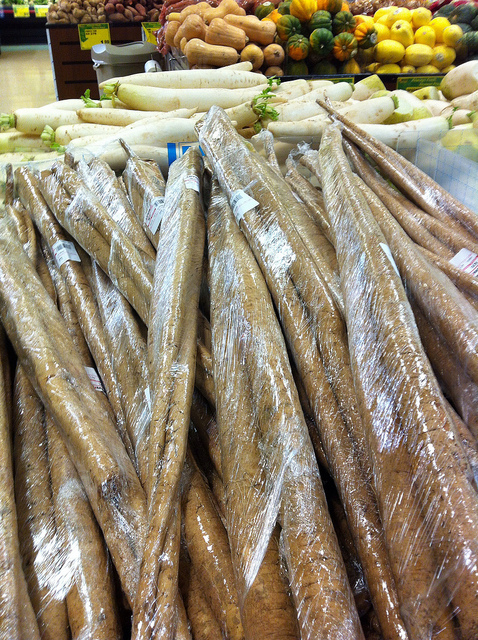 ), an entire aisle of dried seaweed, all sorts of pickled foods (see the yellow pickled radishes) and fresh seafood. 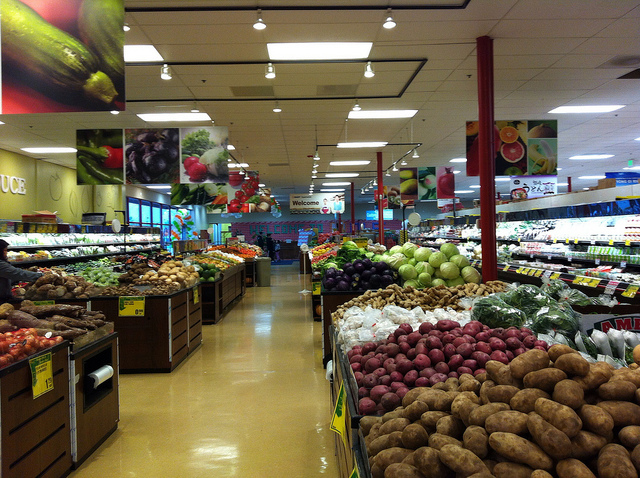 There is a large produce section and all the day to day household items one would need. The employees were super friendly. 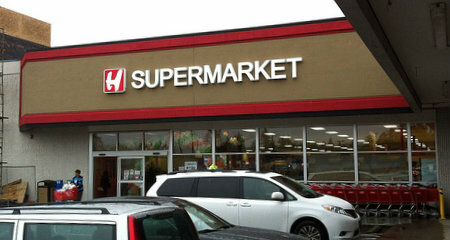 The H in H Mart stands for “Han Ah Reum,” a Korean phrase meaning “arm full of groceries.” The chain’s website shows two other locations in Washington State (Federal Way and Lyonwood. There are also locations in 12 other states and Canada, mostly on the east and west coasts. They recently opened a location in London. This entry was posted in Chain stores (there are a bunch of them), Lakewood, Stores and other places that sell you things, Unique Shopping (stores with some personality), WA State - Pierce County and tagged chain, H Mart, Han Ah Reum, Lakewood, mochi, pickled, produce, South Tacoma Way, udon on April 5, 2013 by admin. 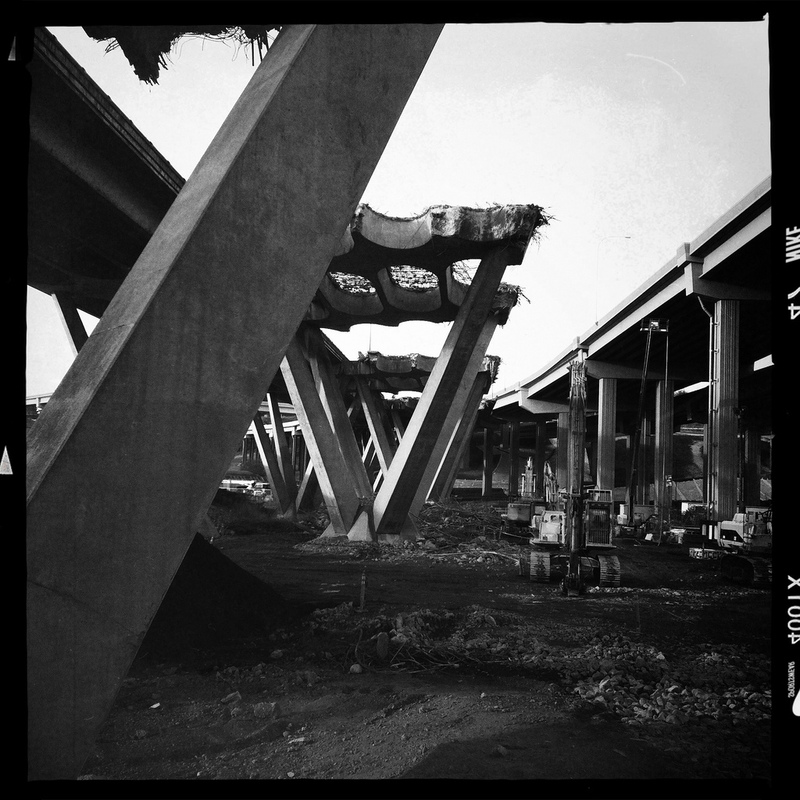 Dear husband said he’d be happy to show me a splendid new place of the day and he took me here to South Tacoma Way and Sprague where they are tearing down the old Nally Valley overpass and have constructed the new one. This scene will not be here long! Husband and I agreed that it was very post apocalyptic. And nothing says Christmas Eve like Post Apocalyptic! 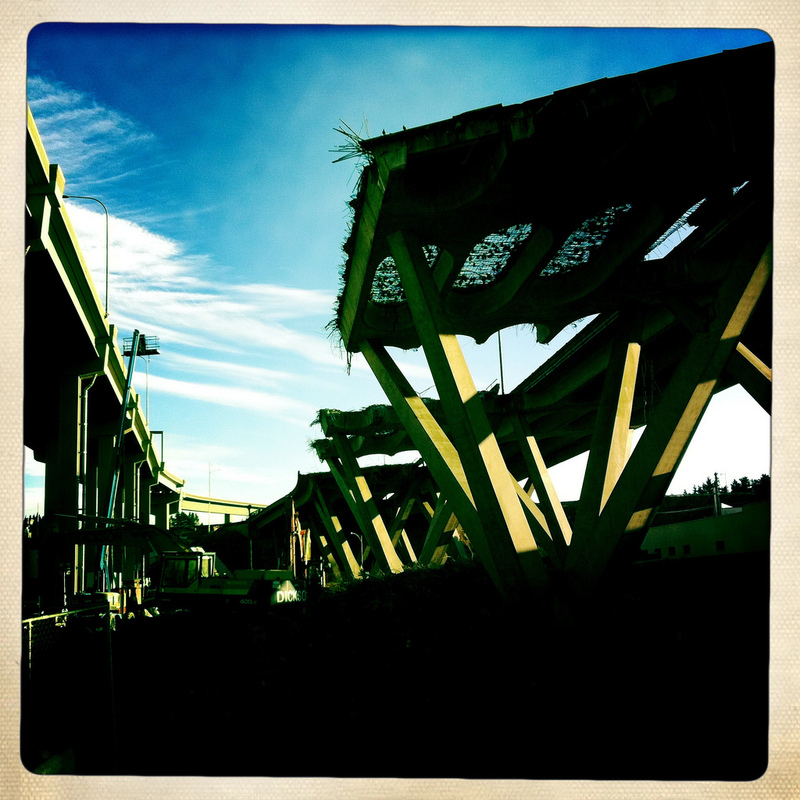 This entry was posted in Government, Tacoma, Their future is in question, Travel, WA State - Pierce County and tagged apocalyptic, construction, demolition, Highway 16, Nalley Valley, post, South Tacoma Way, Sprague on December 24, 2011 by admin. So, dear husband and I are driving down South Tacoma Way on our way to see Captain America (which was really pretty good). I’m thinking about what I am going to use for a new place of the day. I’ve already done the movie theater and the fish taco place, so no go with our destinations. 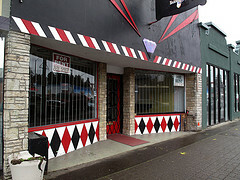 Then I look up and see Mamni’s Bakery at 9205 S Tacoma Way, Lakewood, WA 98499! Oh joy, I’ve been meaning to go there since my friend recommended it! We loopy looped around and went on in! 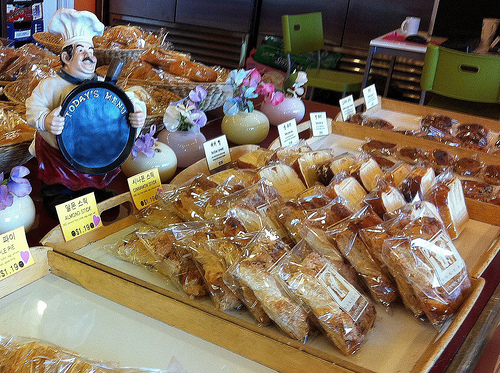 I can’t say I’ve been to a bakery like this before. Every individual item is wrapped. 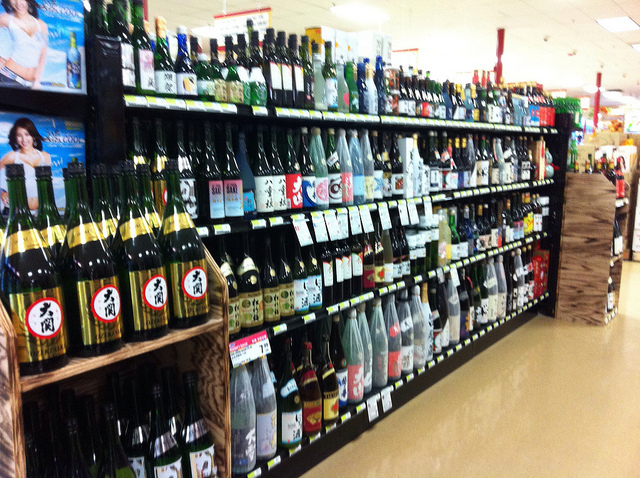 We purchased about 10 things and took them home to enjoy after the movie. After we got home dear daughter started asking what things were. Ummmm. Don’t know! They aren’t labeled! Though we can kind of tell by looking at them 🙂 The treat for tonight was very tasty indeed. Now that we know where they are, we’re sure to be back! This entry was posted in Coffee Shops, cafes and bistros, Lakewood, Restaurants, WA State - Pierce County and tagged individual, Korean, Lakewood, Mamni Bakery, South Tacoma Way, Tacoma, treats on July 26, 2011 by admin. This entry was posted in Tacoma, Their future is in question, WA State - Pierce County and tagged American Dye Works, empty, hair, security, South Tacoma Way, Tacoma, Untouchable Cut, vacant on May 6, 2011 by admin. So for the first time today, my husband said let’s go find you a new restaurant for lunch so you have your new place of the day. That was so sweet! He had read a good review of Patty’s Burgers, so after seeing The King’s Speech at the Grand, off we went! 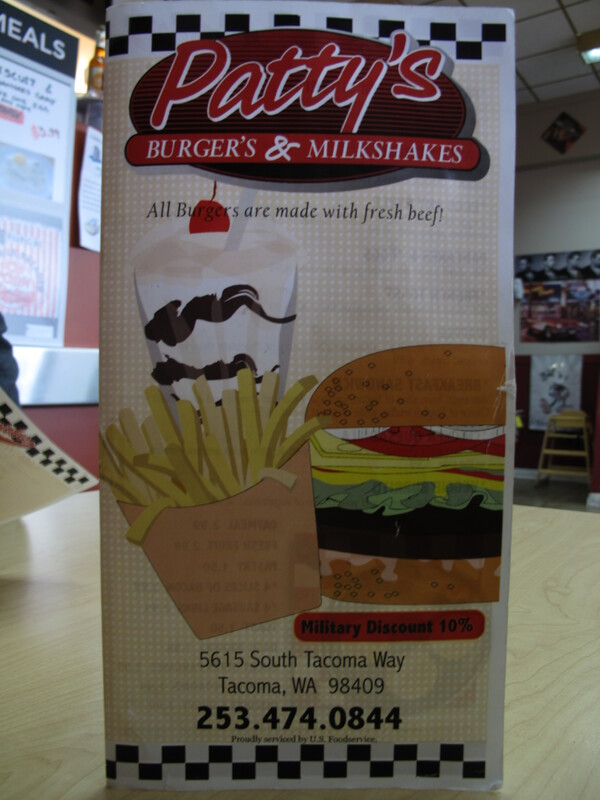 Patty’s Burgers is a cheerful place with a 50s theme. The service was super friendly and quick. Our burgers and fries would never be mistaken for health food, but they were a tasty treat! Next time I’m trying one of those great looking milkshakes! 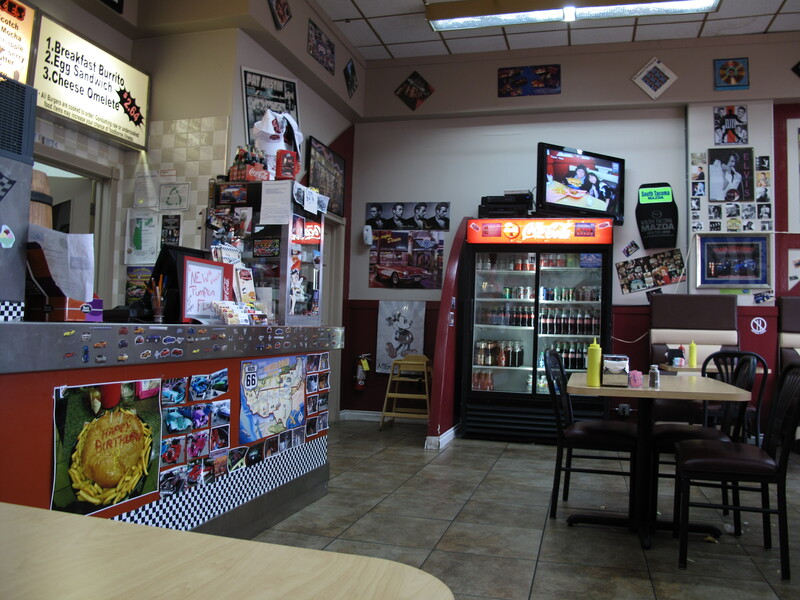 The TV screen shows photos of people that have tried the ambitious cake burger with 8 hamburger patties. 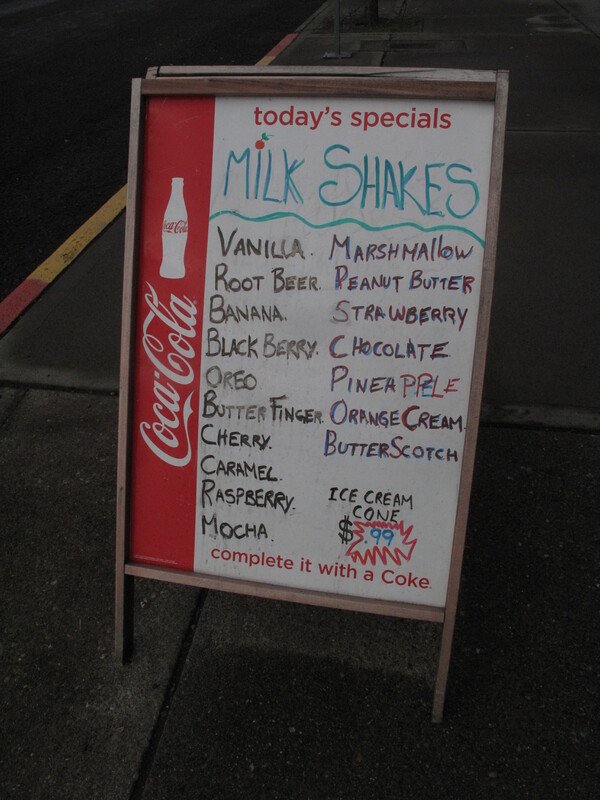 This entry was posted in Coffee Shops, cafes and bistros, Restaurants, Tacoma, WA State - Pierce County and tagged Business District, Cake Burger, hamburger, King's Speech, milkshake, Patty's Burgers, South Tacoma Way, Tacoma on January 9, 2011 by admin.